St. Simon, the apostle (who shares tomorrow's October 28 feast with St. Jude) is often pictured with a saw in paintings or on statues. It is one of his chief symbols since he was said to have been martyred by being cut in half with a saw. As we recall this feast day of St. Simon the Zealot, sugar cookies decorated like saws are a good way to illustrate that symbol. Use the sugar cookie recipe of your choice or this one published in past at Catholic Cuisine which is the standard one I use. 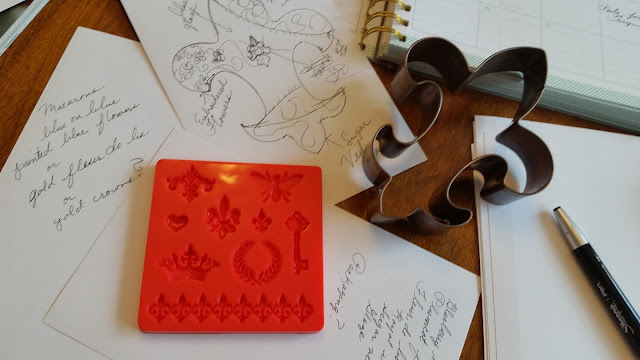 This is the cookie cutter that was used. I made a decorator frosting and tinted it brown and grey to replicate the colors of a saw. Cookies are always a fun way to incorporate saint symbols. Enjoy. St. Simon, Pray for us! There are two foods that I associate with going to visit my relatives on the farm where my Polish American father was born and raised - and Mizeria, cucumber in a creamy dill dressing, is one. It was a staple. From most Polish families you will hear the same. As a classic Polish salad side dish it seems very fitting for the feast day of St. John Paul II (Karol Wojtyła), October 22. And it is super simple to make - a bonus for a busy day. Peel cucumber(s). Slice cucumber very thinly and place in a bowl. Sprinkle slices with salt and let sit for 30 minutes to pull the liquid. Drain water from the salted cucumbers and gently squeeze to expel any remaining water. Pat dry with paper towel. Mix sour cream, vinegar, sugar, and dill in medium bowl. Toss cucumber slices in mixture. Allow the salad to marinate in the refrigerator for at least an hour. Taste, season with salt and freshly ground pepper as needed and serve. Garnish with dill if desired. Serves 4 but is easily doubled or tripled. St. John Paul II, the Great, Pray for us! Born (and baptized) in Italy on the Feast of the Epiphany, January 6, 1786, Gaspar Melchior Balthazar del Bufalo was named after the three Magi who visited the Christ child. The feast of the Epiphany is celebrated as a manifestation of Christ to the Gentiles, represented by the Magi. This was a perfect name for a man who would spend his life to bring the Word of God to others, constantly on the move as a missionary. 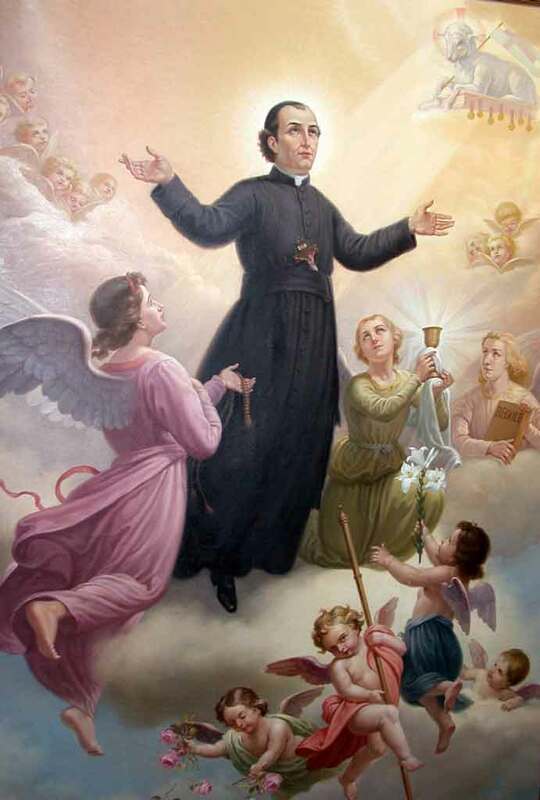 St.Gaspar was the Founder of the Missioners of the Precious Blood and his feast is observed October 21. I confess… whenever I see the name of St. Gaspar del Bufalo, I always think of the bison that roam America’s plains or the hot wings originating in Buffalo NY. So I like the idea of actually having Buffalo hot wings (or buffalo burgers?) on his feast even though St. Gaspar's family name has nothing to do with either of those “buffaloes”. I have included a typical hot wings recipe or you can cheat like I did and just buy them ready-made from your favorite wing stop. Disjoint and cut the chicken wings into two pieces and discard the tips. Rinse and pat dry. The wings must be completely dry in order to fry properly, since there is no batter or breading. Preheat the oil in a deep fryer or a large deep pan to 350°F. Add the chicken wings a few at a time to the hot oil. Do not allow the oil to cool as the chicken is added. Deep-fry for 10-12 minutes or until crisp and golden brown. Drain well by shaking in the fryer basket or place on metal rack to drain. Blend melted butter with 1/2 bottle of hot sauce for medium-hot wings. Add additional hot sauce for hotter wings or additional butter for milder wings. Combine the wings and the hot sauce in a large container. Let stand, covered. Serve. Wings (hot or BBQ) are always a good option on the angel associated feast days as well. St. Gaspar del Bufalo, Pray for us! 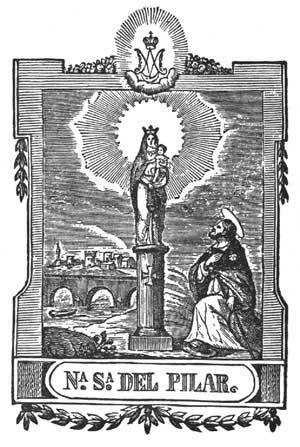 Our Lady of the Pillar is the title given to the Blessed Virgin Mary from her appearance to the Apostle James the Greater in 40 AD, as he was praying by the banks of the Ebro River in Spain. He was disheartened with the lack of converts to Christianity. Mary miraculously appeared before him atop a pillar accompanied by angels. She assured St. James that the people would eventually be converted and their faith would be as strong as the pillar she was standing on. She gave him the pillar as a symbol and a wooden image of herself and instructed him to build a chapel on the spot. The wooden image is enshrined at the Basilica of Our Lady of the Pillar in Zaragoza. Several years ago, Anne shared a beautiful pillar cake, made from a swiss roll cake which is in the archived posts. It is lovely. I also had an idea for a simpler, no baking involved pillar for her feast day. 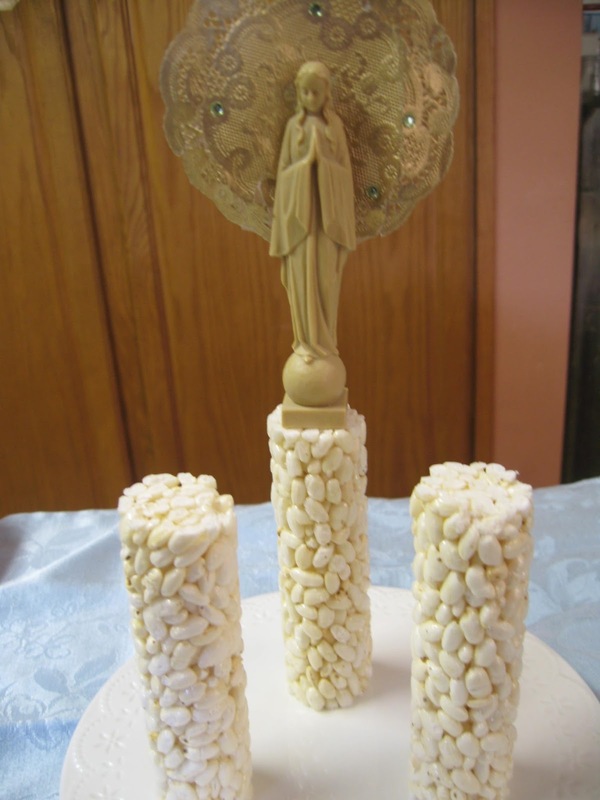 These rice cake sticks or rolls, make nice pillars - either on their own or as a place to set an image of Mary (as is included in the above photo). It is a snack idea that provides a fun way to open a conversation about our lady under this title and the symbolism of the pillar. As an added note: In the United States the feast is also tied to Christopher Columbus and our Columbus Day holiday. When Columbus embarked from Spain on his journey, to find a sailing route to India, he placed the three ships under Mary's patronage. As the weeks dragged on with no land in sight, the sailors grew restless. Columbus' journal indicates he invoked Our Lady under this title, declared that if they did not see land by her feast day they would turn back. On October 12, 1492 the navigators spotted indications of approaching land - one of the islands of the Bahamas. Our Lady of the Pillar, pray for us! Nuestra Señora del Pilar, ruega por nosotros! While today's feast celebrates Our Lady of the Rosary, the entire month of October is dedicated to the Most Holy Rosary. This idea adds drops of fruit sauce to the top to create a visual rosary. In a small saucepan, whisk together 1 Tbsp granulated sugar and cornstarch . Stir in water and add berries. Cook over medium heat whisking frequently, until mixture reaches a boil. Allow mixture to gently boil about 5 minutes whisking constantly and reducing temperature slightly if necessary to reduce splattering, until sauce has thickened. Remove from heat and force sauce through a fine mesh strainer into a bowl to remove seeds (skin, etc. ), set aside. In a large mixing bowl, beat together cream cheese and granulated sugar until fluffy, about 1 minute. Mix in egg and egg white. Add vanilla and lemon juice. Set mixture aside. Melt white chocolate with cream in a double boiler until melted and smooth, Add melted chocolate mixture to cream cheese mixture and blend until smooth. Pour cheesecake mixture into the crust and spread evenly. The idea I had seen for adding shapes to the top of a cheesecake suggested using a clean medicine syringe. Fill with fruit sauce and begin to pipe small circles in a rosary pattern over cheesecake. It was more challenging than I thought to get uniform drops. Take a toothpick or sharp pointy move it through the center of each circle to connect “beads”. Melted chocolate chips were used to make a cross. Bake cheesecake for 40 minutes. Turn oven off and leave cheesecake in the oven for 5 more minutes. Remove from oven and cool. Refrigerate for about 6 hours until fully set. 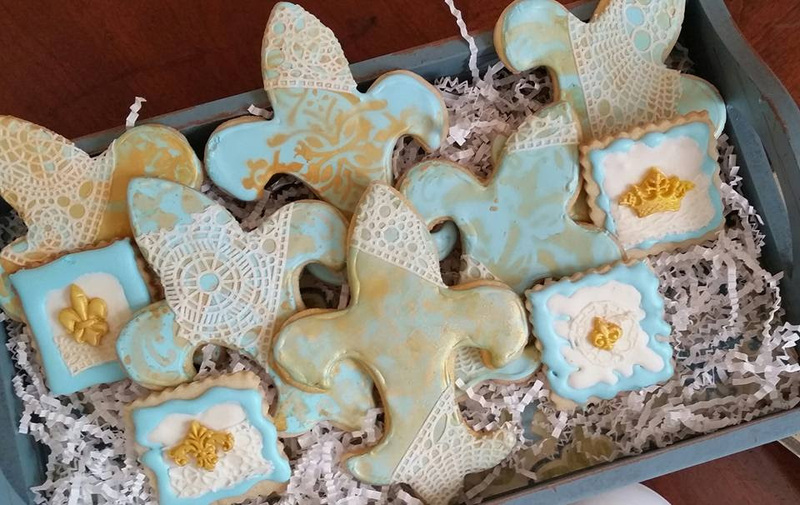 These cookies were submitted by LaDawn Wilson in honor of Our Lady. Thank you, LaDawn! With Mary's birthday, Our Lady of Sorrows, and soon Our Lady of the Rosary feast days in such close proximity, I could not get her out of my mind. (Thank goodness, right?). I have been working with sugar veil and finally figured out how to get it out of its mold without it ripping. It is true what they say about sugar veil, Find a spot in your home where it works. Trial and error, for sure. The trinkets are just fondant I sprayed with edible gold. The background on the fleur de lis was stenciled with the same spray. I highly recommend Sweet Ambs site for sugar veil tutorials and buying information. She also mentions Haniela's tutorials, which have been extremely helpful. You can find additional ideas for the Blessed Virgin Mary and the feast of Our Lady of the Rosary in the archives. Tonture is the custom of shaving part (or all) of the hair of the head, derived from monastic observance in the fourth and fifth centuries. Shaving the whole head or leaving an outside ring of hair on scalp (representing a crown of thorns) became common for clerics in the sixth and seventh centuries. Though used by many early religious orders, most associate this hair style with the Franciscans, especially St. Francis. The idea of cakes and other treats that resembled a ring tonture have been posted here at Catholic Cuisine in the past for St. Francis feast day, October 4. This is another variation idea made with cupcakes and is very easy and quick to pull together. Make cupcakes as directed using a yellow or white cake. Pipe chocolate frosting around outer edge of each cupcake to form a tonture. The raised nature and the ability to make it look curly or wavy add to the appearance as hair and is set apart from the lighter color of the cupcake. Serve for the feast of St. Francis or one of the other typically tontured saints. St. Francis of Assisi and all the Franciscan saints, Pray for us!